A very fascinating assessment of Miles Davis and Neil Young's music on At Length » Direction Nowhere by Nate Chinen. 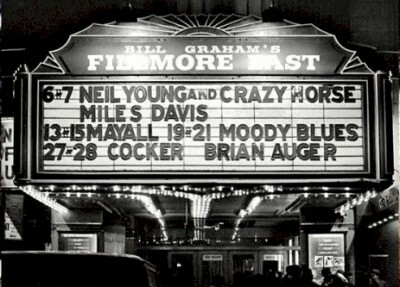 On March 6 and 7, 1970, at the Fillmore East in New York City, Miles Davis opened for Neil Young and Crazy Horse. While this is the only known intersection of the two artists, Chinen lays out a detailed analysis of how their careers and artistic approaches converge and diverge. That setting, cosmic only in culturally suggestive terms, was the Fillmore East, a New York outpost of Bill Graham’s hippie empire. Young was the headliner, and Davis the opener. As far as we know, there was no particular spark of friction or connection between the two. But the musical evidence, even 40 years later, attests to the mysterious gravity of that moment. For all their differences — what you might inadvisably call their intersection distance — Young and Davis were both in the thrall of reinvention, pushing a distinctly contemporary, shrewdly cooperative agenda. It also happened that they were each in the midst of creative transition as they took the Fillmore stage. Few musicians of any era have outdone Davis or Young when it comes to catalog savvy. For Davis, that development has been posthumous: the trumpeter died in 1991, just as the compact-disc reissue boom was getting under way. His music has since been endlessly repackaged and repurposed, and in some instances — like Live at the Fillmore East (March 7, 1970): It’s About That Time, released by Sony Legacy in 2001 — made commercially available for the first time. Last year Legacy put out what would seem to be a culminating gesture: The Complete Columbia Album Collection, spanning 70 discs. Young’s camp released a fetish object of their own in 2009: Neil Young Archives Volume 1 (1963-1972), a 10-DVD or Blu-Ray set consisting of obscurities, rarities and assorted other flotsam from a roughly half-century career. Among its bounty is the concert recording that was also released, in more standard form, as Live at the Fillmore East on Reprise in 2006. The material was assembled with active participation from Young, who had ample reason to reflect fondly on the Fillmore shows. It’s almost strange to think that Neil Young and Miles Davis are icons of our culture, one stubborn and rumpled and the other truculent and proud. It’s strange because each is a study in restless motion, fumbling forward with steady purpose. Which is perhaps the singular recommendation for this Fillmore testimony: It captures both artists at a pinpoint moment, spinning hard on their separate trajectories, each on his way to someplace else. An essential read for jazz and rock fans on At Length. More on other artists influenced by Neil Young's music. Great Article. Thanks Thrasher. Love both Miles and Neil and appreciate the mention on this blog. The thing they have/had most in common was the total disregard for audience expectations - following the muse. Thanks Thrasher for highlighting this article. Lots of good comparing and contrasting can be done when it comes to Miles and Neil. I especially enjoy the observation that both are not true virtuosos with their instruments in the traditional sense, and how their awareness of this becomes one of the key factors to their enduring genius and artistry. I saw Miles Davis many times from 1973 to the late 80's. His mid 70's band with Pete Cosey was an absolute monster...they were a couple decades or more ahead of their time. Their set at Newport in 1975 was completely staggering...and most of the audience was looking bored or confused! This was one of the last shows before Miles took a five year vacation. When he returned, I was at the club show where he stepped off the stage into the audience and played a solo for Cicely Tyson. Fortunately there is an amazing abundance of recordings that we can now enjoy again and for the first time. And with the passage of a few decades, we can see that all of the work is worthy and interesting, but there are certain periods that still have a total immediacy to their work. In this way, Miles and Neil are artists of a true and similar nature.